Whoopie Goldberg and Barbara Walters constantly clashing on set of The View. At one point, Goldberg looked off set to make a face as Walters read out how much members of the royal family are worth. A source told Confidenti@l that when Goldberg came off the air she was visibly frustrated and overheard loudly complaining “for seven minutes” about Babs’ controlling ways. An animated Goldberg called Confidenti@l twice Wednesday night to deny this story. “Who the f— told you this?” she demanded. The is not the first report of friction between the two. In January, Howard Stern said on his SiriusXM satellite show that while he was guesting on “The View” he got the sense that the two hate each other. Howard Stern is not alone in his assumption. I was on disability from work for two months and watched The View every morning and I remember talking my mom on the phone who also watches and I told her Barbara is rude to the rest of the panel because she constantly interrupts them and cuts them off and I don't think neither Whoopi nor Joy liked Barbara. You could see the tension between them. 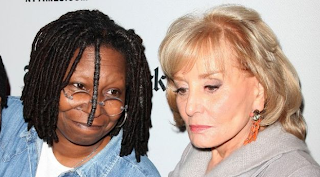 Whoopi is trying to save face, she don't like Barbara Walters at all. Truthfully, I couldn't care less about that baby and ALL his relatives.